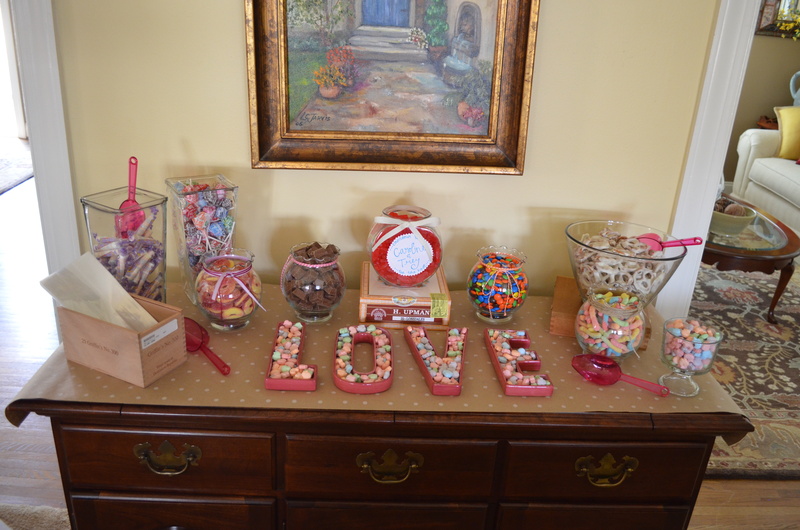 At the bridal shower previously mentioned (see here), my friends gave me the task of creating a candy buffet. It was a causal request via text, but you know me, I naturally took it as a challenge to create the cutest thing possible. And do not buy containers. Even if you don’t own them, ask around and borrow them. I went home and raided my mom’s collection of glassware. She had several of the round vases from my brother’s wedding. My grandmother gave me taller vases. And the bowl of pretzels is a salad bowl I use almost everyday. 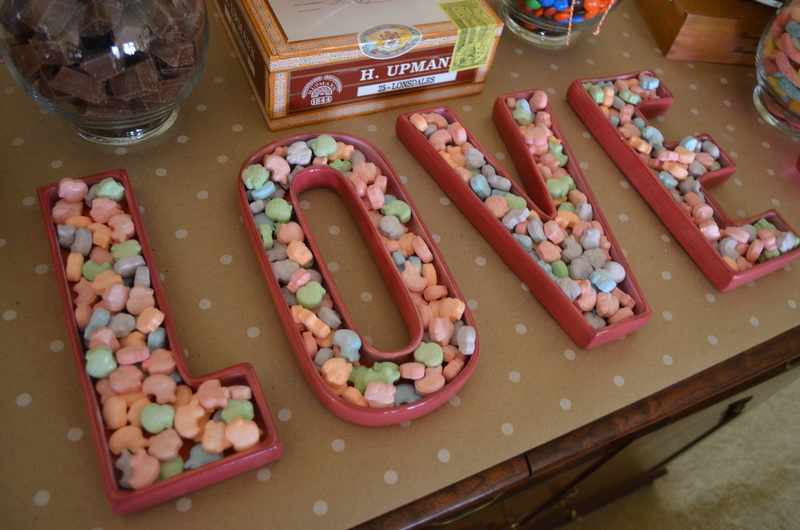 My mom also had these adorable letters from Valentine’s Day with ridges perfect for holding candy. And it was her idea to put the Swedish Fish in a glass fish bowl. Picking the candy: My initial problem was figuring out how much candy to get. I set a budget of $35 (though I did end up going over it), and we were planning on having 30 to 40 people in attendance. I avoided the candy at Sam’s. It was more candy than I needed, and each bag cost around $10. So I decided to pick a mix of name brand candy and cheap generic candy. M&M’s, Swedish Fish, Smarties, Sweet Tarts and Kit-Kat Bites covered the name brands. Gummy worms, Peach rings and lollipops were cheap and helped fill in the gaps. Plus, I decided to make chocolate-covered pretzels, which ended up being the most popular treat. 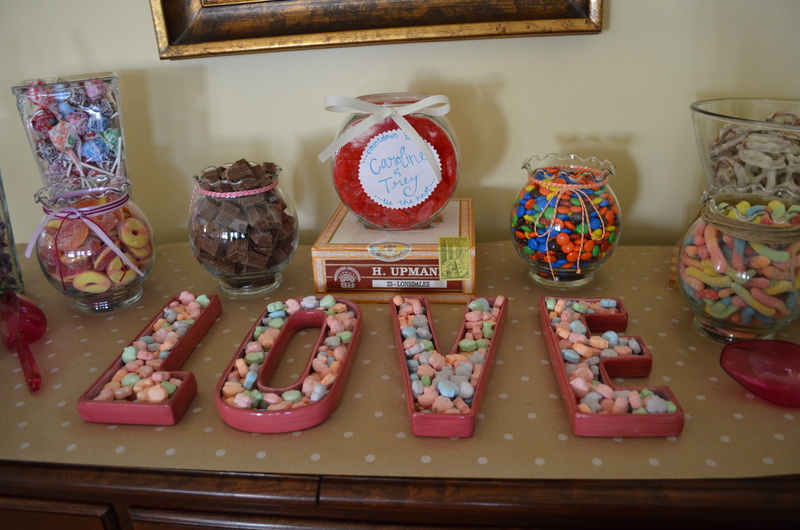 Decorative touches: With your containers selected and the candy purchased, the rest is in the details. I found rolls of polka-dot brown wrapping paper at Target for only $1 that I used as the table covering. 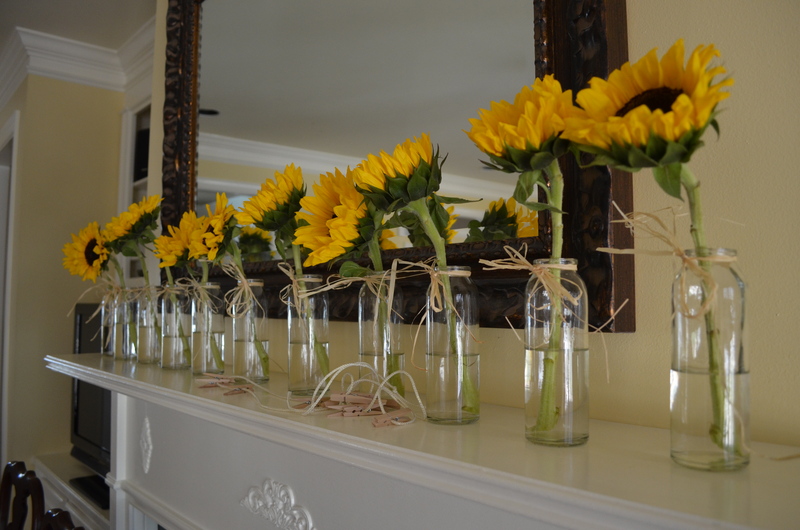 And then using string that I had around my apartment, I tried to decorate each vase to add touches of color. I found the candy scoops at Party City. I didn’t purchase a scoop for each container of candy. I figure since it was a relatively small party, people could share. To go bags: The candy buffet was set up in the middle of the party. So as the afternoon progressed, everyone came around for a handful of candy here and a few chocolate-covered pretzels there. But you could see it in everyone’s eye that they were hoping to take some home. For to-go bags, I found these cheap favor bags at Hobby Lobby. After buying them, I realized that they did not come with twist ties, so I set out of roll of washi tape to help secure the bags. If you haven’t already noticed, my candy buffet uses several cigar boxes. 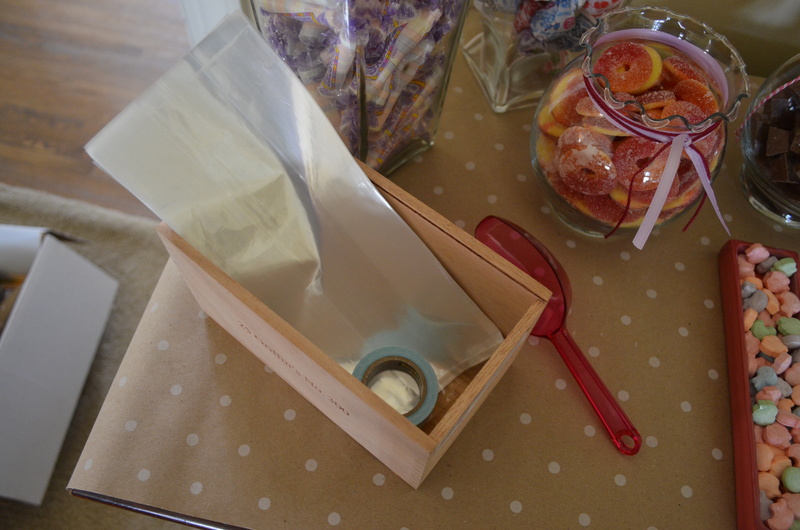 Below, I used one to help store the bags and washi tape. Others were used to add a little height to some containers. 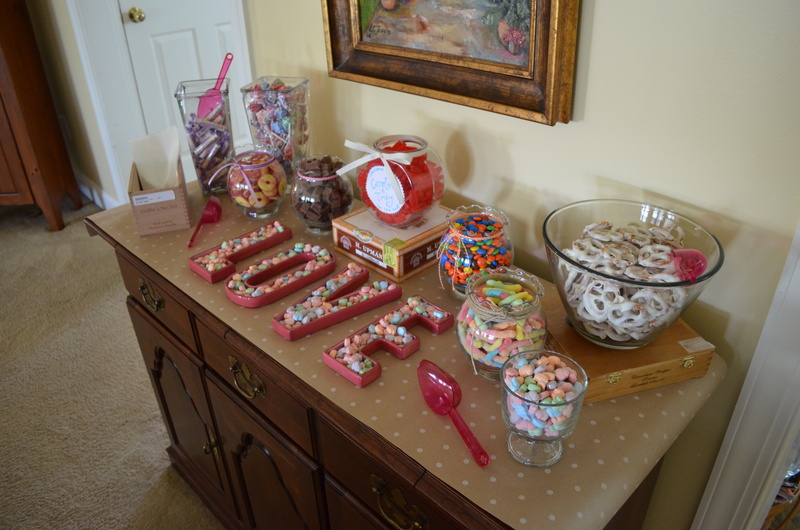 Come with a plan: The day before the party, I mocked up the candy buffet to see what it would look like. I filled each container with its respected candy to make sure I had enough, but more importantly, I was able to think things through and play with different placement options. I’m so glad that I did this because when I showed up to help set up the next day, it was a little chaotic. People were running around everywhere, but since I knew what I wanted to do, I was able to set everything up in 10 minutes. Plus, I made sure to bring my own essentials – scissors, tape and a sharpie – just in case. 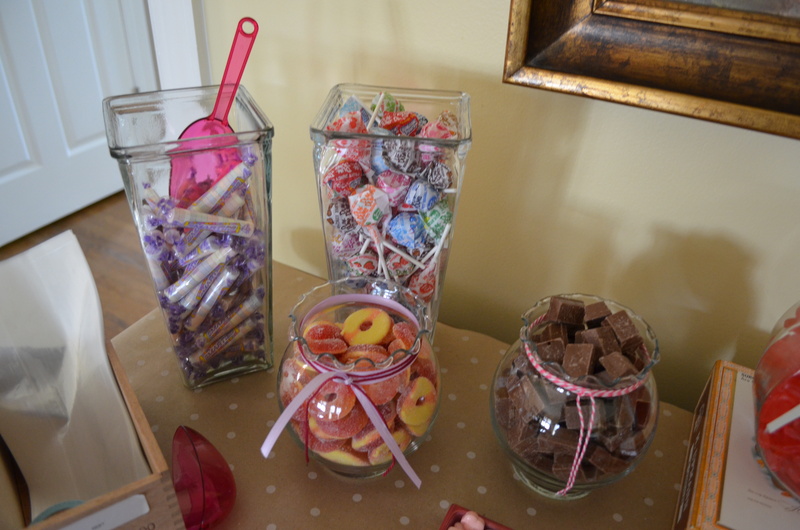 Since the party was not at my house, I was able to set up the buffet without having to search for these things. 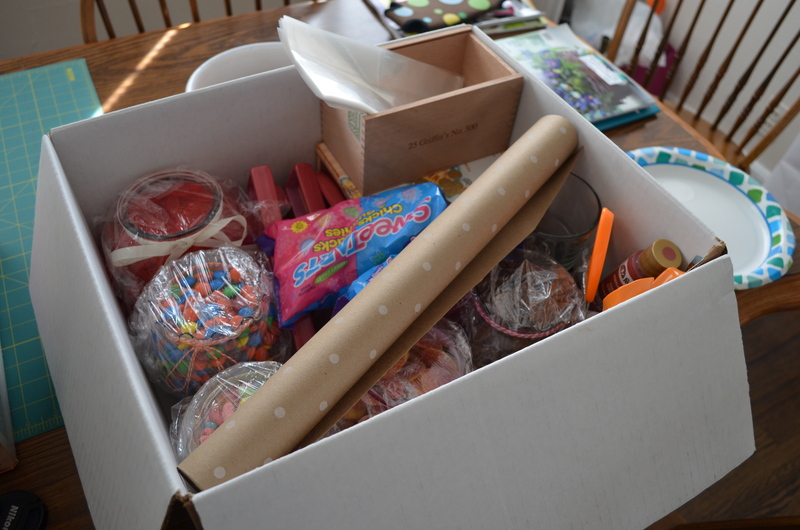 I just threw everything in a box and brought it to the party. Some people want their candy buffets to be themed in specific colors. Obviously, I didn’t go that route. 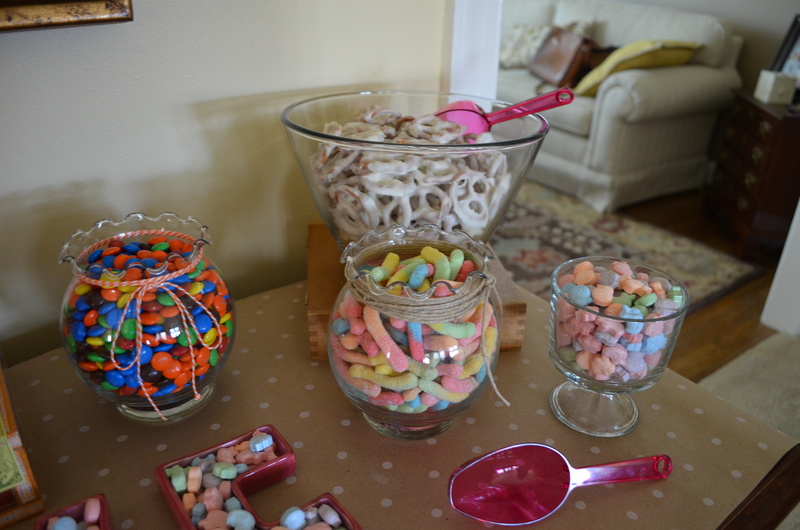 I love how my candy buffet turned out so colorful and sweet. And it was so fun to pull it all together for an event celebrating such a close friend. This past weekend, my friends and I threw a bridal shower for my friend Caroline. 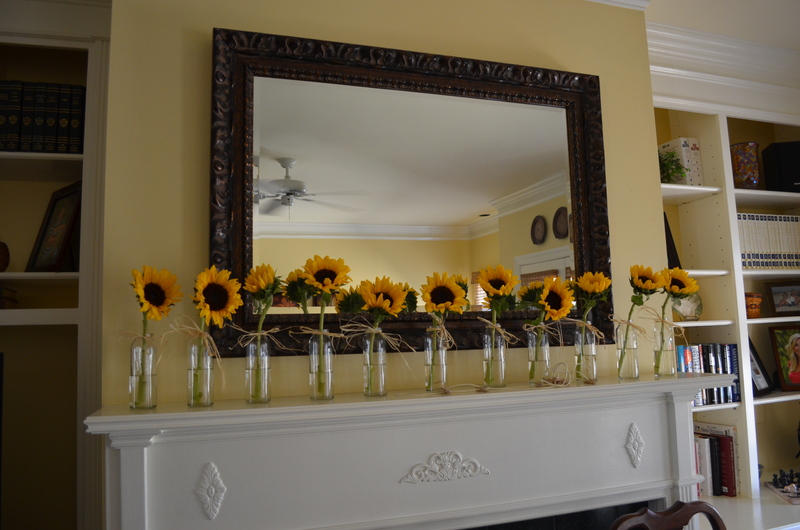 And though the entire shower could be described with words like adorable, sweet and beautiful, this idea for displaying sunflowers, I think, took the cake. Wedding registries overwhelm me. I know they are meant to make gift buying easier for wedding guests, but I just see a list with way too many options. Plus, if I’m going to buy a gift, I want it to be something more special than a muffin pan. So my crafty natural kicks in, and I embrace a homemade gift. 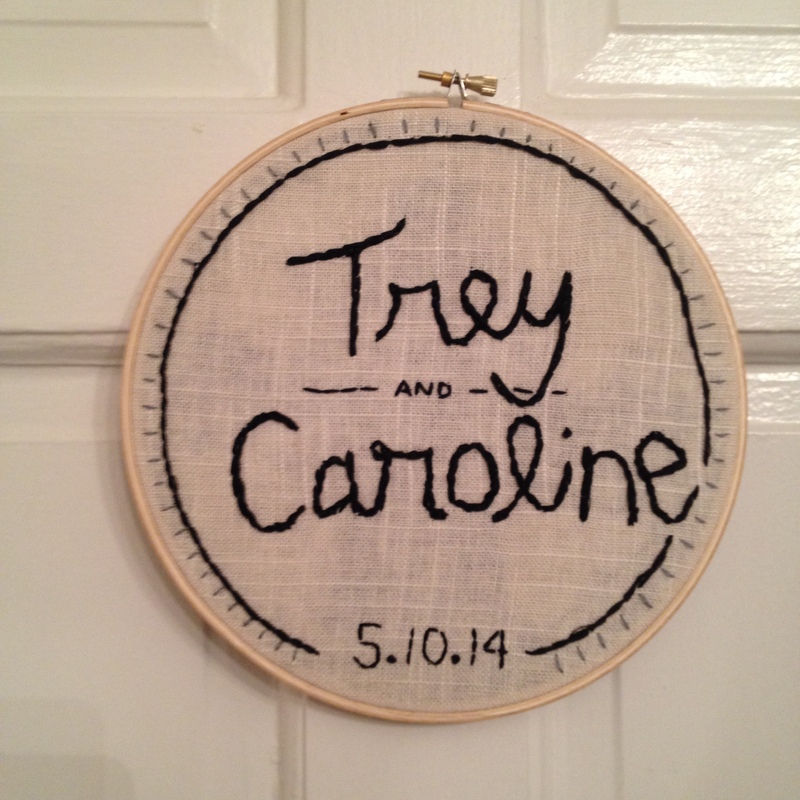 For my most recent shower: a wedding embroidery hoop. 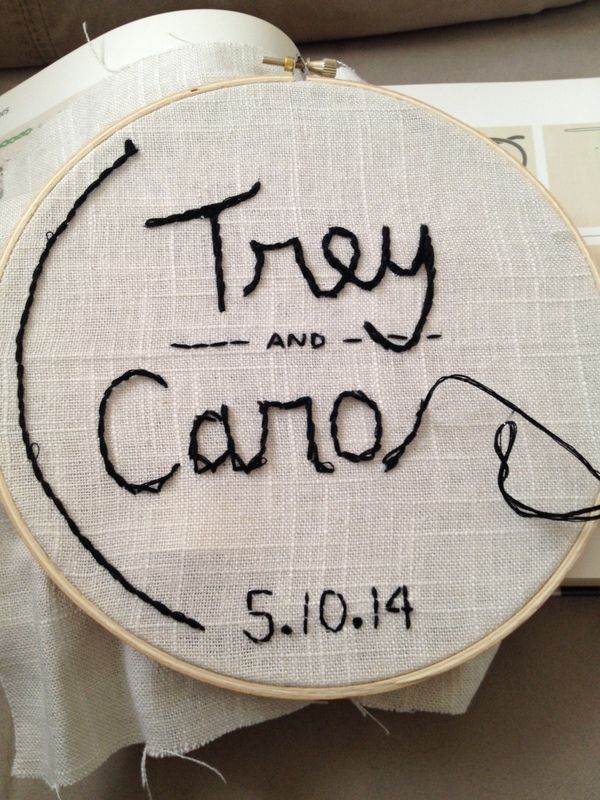 My dear friend Caroline is getting married in May, giving me a great excuse to create this project I’ve seen all over Pinterest. I decided to keep the colors simple. Caroline is a very colorful person, and by using a neutral colors, I figured it would match whatever colors she decides to accompany it. I could probably learn a more “official” style of stitching. My embroidery skills are self-taught, but I think in this case, it turned out quite adorable! 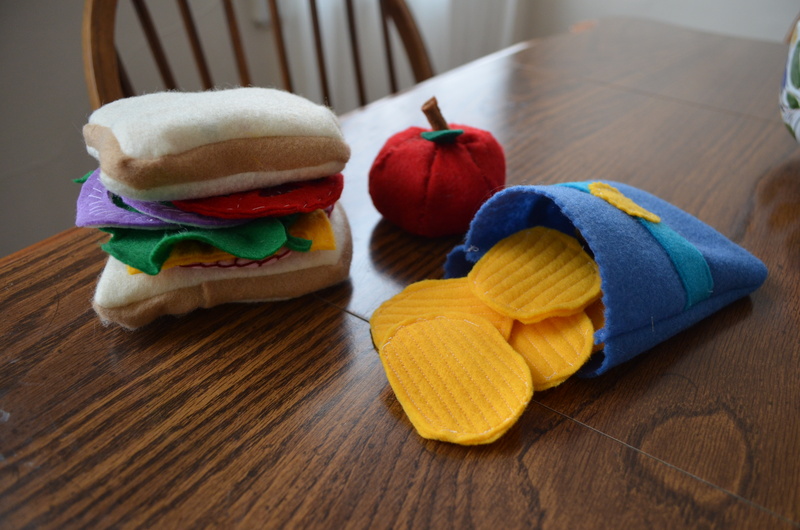 Just when I thought the felt pancakes and fried eggs were the cutest things I had made in awhile, I decided to make a felt lunch, complete with a sandwich with all the toppings, a bag of chips and a bright red apple. 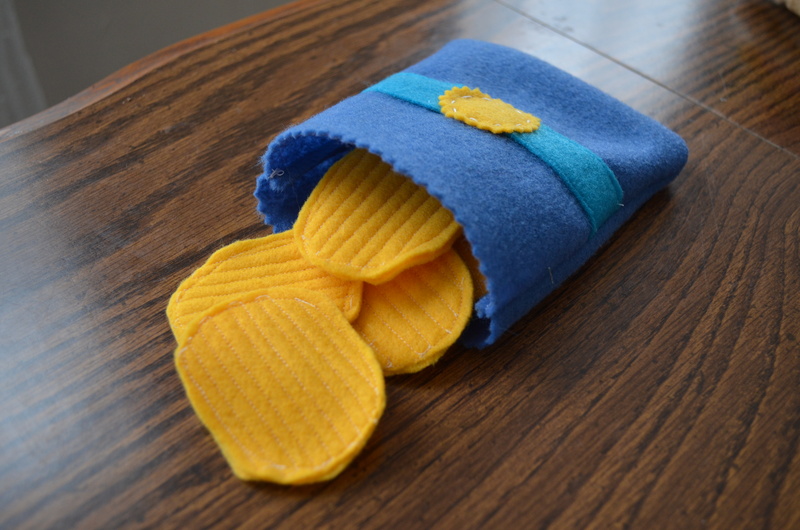 Thanks to Pinterest, I found the idea to make a bag of felt chips. 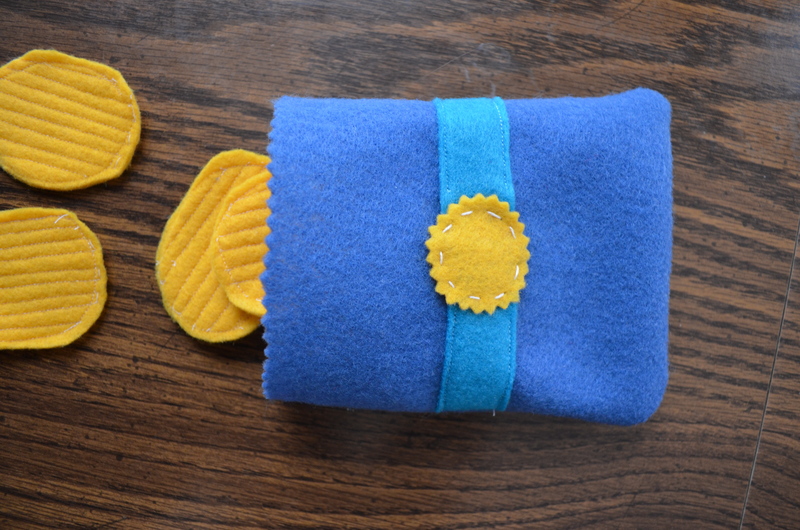 After cutting out two ovals of yellow felt, I used my sewing machine to create ridges. I sewed rows of straight lines and then an additional line that outlined the whole thing. I also found an idea for tortilla chips, using off-white felt cut into triangles. The felt chip bag took less than 10 minutes to make. After cutting out two rectangles, I used my pinking scissors to create the zigzagged edge. Then taking one of the rectangles, I sewed the strip of light blue felt to the right side of the fabric. Next, I hand stitched the the yellow sun (again, cut out with my pinking scissors). Finally, I put the right sides of the two rectangle pieces together and sewed along the edge (you don’t need a large seam allowance with felt). Flipped it right side out and voila! 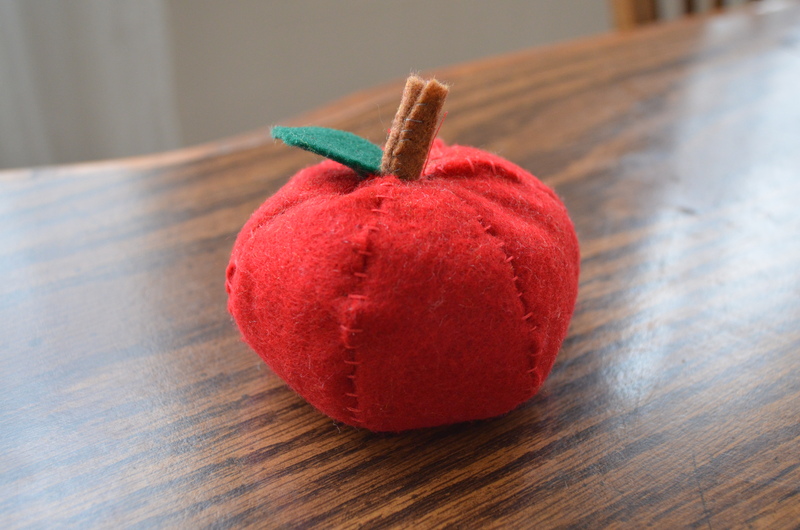 The felt apple was a little trickier. I found this tutorial online that I used as my guide. Basically, you need 6 pieces of red. (I just eye-balled the shape based on the tutorials’s template.) Putting rights sides together, I blanket-stitched the sections together. As you can see, this made it so you could see the red stitches. You can hide the stitches by using a sewing machine, but I think I prefer the exposed look. 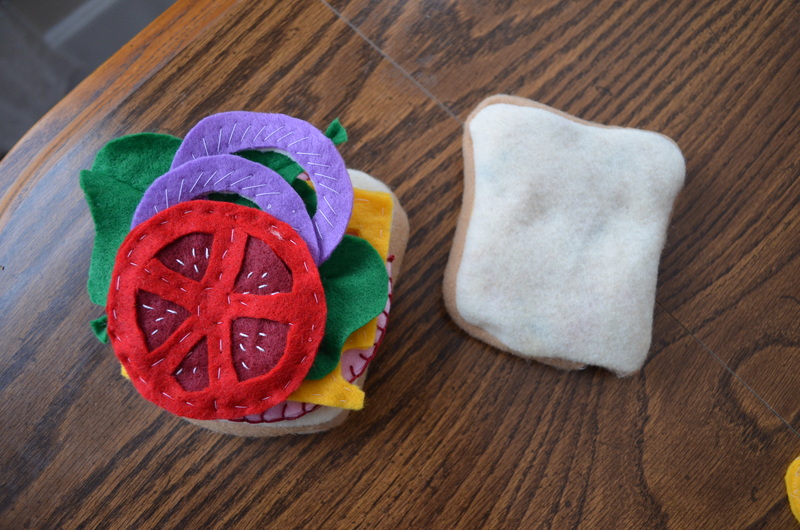 The felt sandwich is made up of several layers, each adding a pop of color. 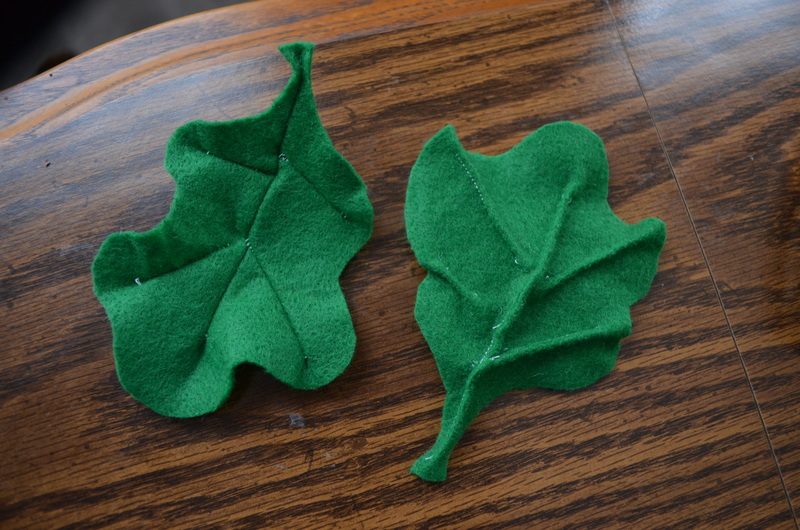 Starting with felt lettuce, I cut out a leaf-type shape out of green felt. Then, using my sewing machine, I stitch short lines to create veins. 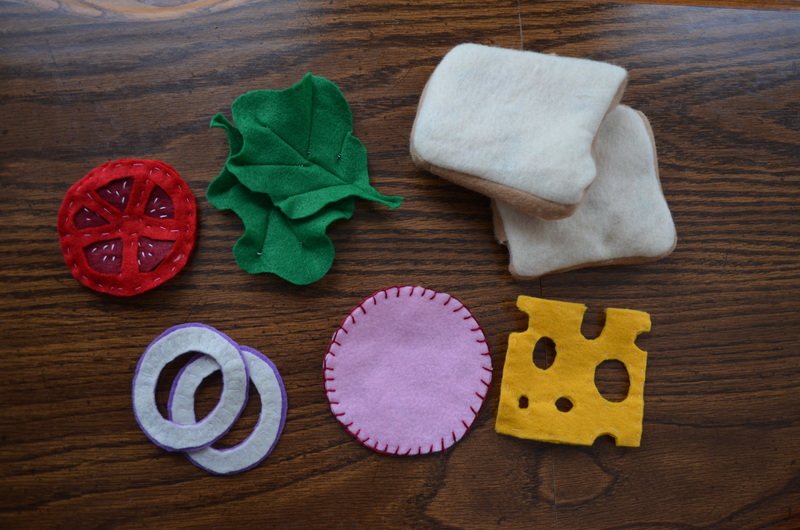 For the felt tomato, I used three pieces of felt: two round pieces of bright red felt with sections cut out and and one round piece of the dark red felt, sandwiched between the other two. I used white thread to stitch seeds, and then I hand stitched everything together. 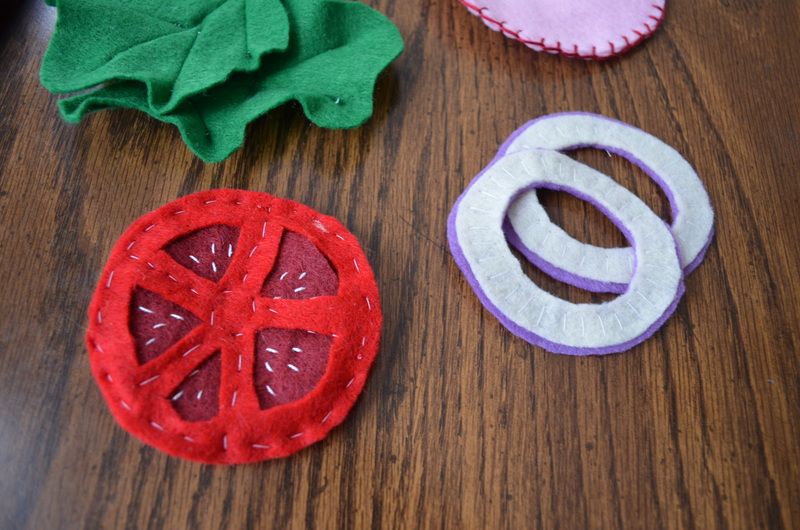 The felt onions were made with a piece of purple felt and a piece of white felt. I spent an hour or so trying to come up with the right meat. Using pink felt seemed strange, but then an epiphany hit. 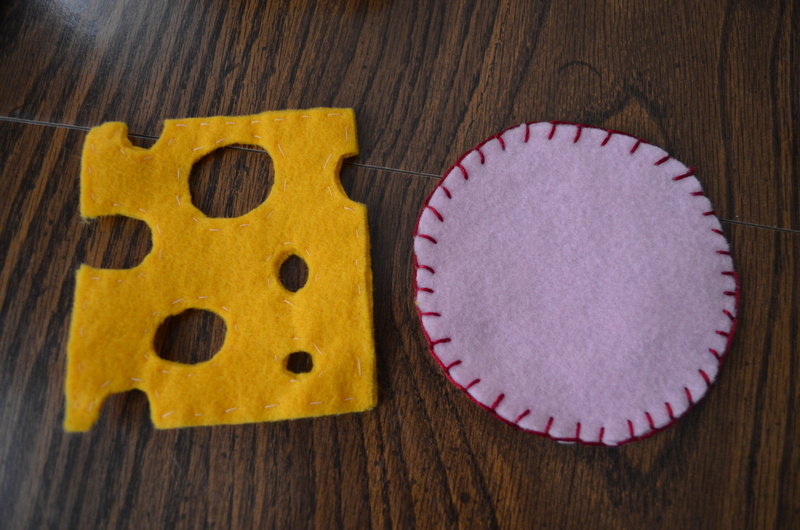 If I blanket stitch the edge with red thread, I can create felt bologna. (And yes, I did just sing the Oscar Myer’s song to help me remember how to spell bologna.) The felt cheese was much easier. I simply cut out a few holes to make it look more distinct. 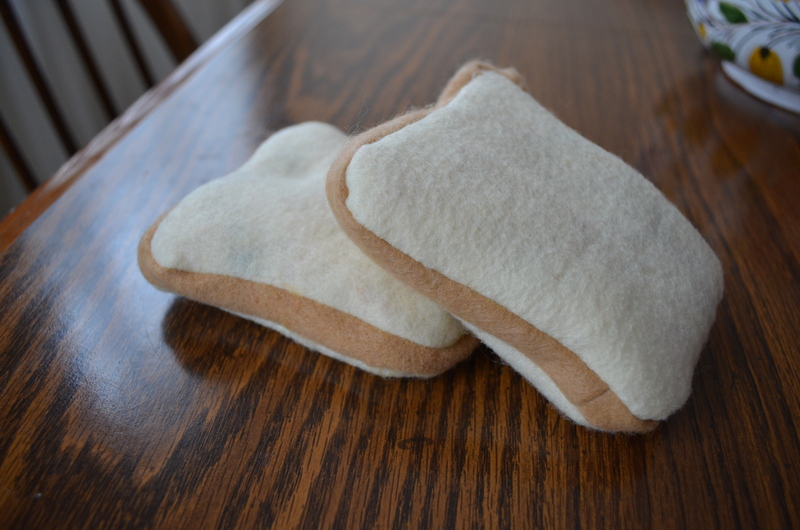 After making a version of the bread by blanket stitching two pieces of felt together, I decided that felt bread needed some dimension. It needed to seem more prominent than everything else. So I added some volume by creating a border of light brown felt and stuffing it with polyfill. I simply adore how colorful the sandwich turned out to be. Plus, when combined with the breakfast items already made, you have even more possibilities for the type of sandwich your child could create. BLT, anyone?